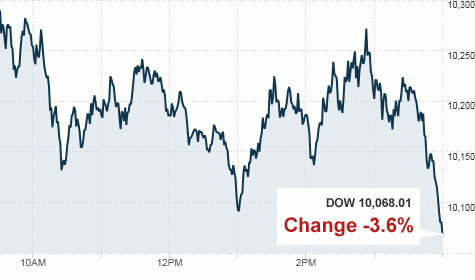 NEW YORK�(CNNMoney.com) -- Stocks got pummeled Thursday, with the Dow, Nasdaq and S&P 500 losing enough to fall into "correction territory" - marked by a drop of more than 10% off the rally highs. Worries about how the European debt crisis and slump in the euro will impact the global recovery fueled the selling, extending the month-long declines. The Dow Jones industrial average (INDU) fell 376 points, seeing its biggest one-day point loss since February 10, 2009. Thursday's point loss was equivalent to 3.6%, the biggest one-day percentage loss since March 5 of 2009. The loss was bigger than that in the so-called "flash crash" earlier this month in which the Dow lost nearly 1000 points during the session, but ended up closing down just shy of 348 points or 3.2%. The Nasdaq (COMP) fell 94 points, seeing its biggest one-day point loss since December 1, 2008. The point loss Thursday was equivalent to 4.1%, its biggest one-day percentage loss since Feb. 17, 2009. The CBOE Volatility index, the VIX (VIX), Wall Street's fear gauge, spiked 30% to a 14-month high of 45.48. Stocks slumped in the morning, trimmed losses in the afternoon as the euro turned positive and then resumed the selling, ending just above the lows of the day. The afternoon selloff intensified after the Wall Street reform bill cleared a key hurdle in the Senate. The bill is expected to pass the Senate. Investors also kept an eye on the escalating conflict between North Korea and South Korea. After weeks of selling, all three major gauges are now officially in a "correction," technically defined as a loss of more than 10% from the rally highs. The Dow is now down 10.2% from its April 26 high, the S&P 500 is down 12% from its April 23 high and the Nasdaq is down 12.9% from its April 23 high. The Nasdaq was already in a correction prior to Thursday's selloff. The correction does not reflect any change in the fundamentals of the U.S. economy or corporate profit outlook, but rather a confluence of events, said Timothy Ghriskey, chief investment officer at Solaris Asset Management. "I don't think people are worrying about a double-dip recession in the United States," Ghriskey said. "But there is uncertainty about Europe's economy and the sustainability of the euro." In addition to being in a correction, the S&P 500 closed below the 200-day moving average, a key technical level market pros monitor. These events tend to have a big impact one way or the other on market direction, Ghriskey said. Falling below these technical levels could put a floor under the selling, said Steven Goldman, market strategist at Weeden & Co. He said investors may be better able to tolerate all the uncertainty about Europe when the market has pulled back from the 2010 highs. "If we are still in a bull market, these might be levels where someone would want to get in," he said. "But we've done a lot of damage technically and the pendulum hasn't swung yet to where we're seeing a healing." Beyond the reaction to the immediate headlines, the stock market may have already been vulnerable to selling, said Brett Hammond, chief investment strategist at TIAA-CREF. "The European debt issues and the euro are very important," he said. "But the market was already poised for a pullback after the enormous run up in the stock market since March of 2009." He said that the historic rally was partly fueled by anticipation that an economic and corporate profit recovery would take hold and that the consumer would take over from the government as an engine of growth. While some of that has happened, market participants may have been betting on a bigger comeback. Market breadth was negative. On the New York Stock Exchange, losers beat winners 19 to one on volume of 2.13 billion shares. On the Nasdaq, decliners beat advancers 11 to 1 on volume of 3.37 billion shares. Euro: The euro was little changed versus the dollar after falling in the morning and gaining through the late afternoon. The euro has seesawed over the last few days after plunging to a four-year low of $1.2234 on Monday. The dollar fell 0.2% versus the yen, erasing bigger morning losses. Economy: Reports on jobless claims and leading economic indicators (LEI) disappointed, while the Philadelphia Fed index, a regional reading on manufacturing, topped forecasts. The number of Americans filing new claims for unemployment rose last week to 471,000 from 446,000 the prior week. Economists surveyed by Briefing.com expected claims to fall to 439,000. Continuing claims, the number of Americans who have been receiving benefits for a week or more, fell to 4,625,000 from 4,665,000 in the previous week. Economists thought claims would fall to 4,600,000. After the start of trading, the Conference Board released its index of leading economic indicators. LEI fell 0.1% in April after rising 1.3% in March. The index was expected to have risen 0.2%. The Philadelphia Fed index rose to 21.4 in May from 20.2 in April, topping predictions for a rise to 20.7. After the mini-crash: New rules continue to be proposed in the wake of the May 6 stock market selloff, in which erroneous trading in hundreds of issues created a panic that dragged down the broad market. Since then, most of the trades have been cancelled, but regulators remain unclear as to what exactly caused the selloff. Out-of-control computer trading may have caused the slump, Securities and Exchange Commission chairwoman Mary Schapiro told a Senate panel Thursday. On Tuesday, the SEC proposed new rules that would impose circuit breakers, or a temporary pause, on individual stocks that experience extreme swings. There are already circuit breakers in place for the broad markets, but this would impact individual stocks. World markets: Markets in Europe slumped, as the euro continued its slide versus the dollar. The British FTSE 100 fell 1.7%, the German DAX lost 2% and the French CAC 40 fell 2.3%. Asian markets tumbled. The Japanese Nikkei fell 1.5%, while the Hong Kong Hang Seng fell 0.2%. Commodities: U.S. light crude oil for June delivery fell $1.86 to settle at $68.01 a barrel on the New York Mercantile Exchange. COMEX gold for June delivery fell $4.50 to settle at $1,188.60 an ounce. Bonds: Treasury prices rallied, lowering the yield on the 10-year note to 3.24% from 3.36% late Wednesday. Treasury prices and yields move in opposite directions.